The DNR board agenda doesn’t name any rivers, but by the counties it names, it seems to be aiming easements for Sabal Trail at the Withlacoochee, Ochlockonee, Flint, and Chattahoochee Rivers. You can contact DNR board members and object. 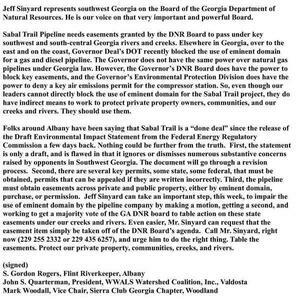 the unnecessary, destructive, and hazardous Sabal Trail fracked methane pipeline. Please do absolutely all you can to prevent the Sabal pipeline project, which invites catastrophic geological impact on precious wetlands that recharge our endangered aquifers. All living things depend on the quality of water. The concept is outrageous, benefits to Georgia marginal. Please, please do what you can to table this ridiculous idea.